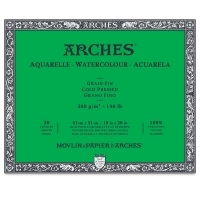 Arches is the product of five centuries of papermaking experience. 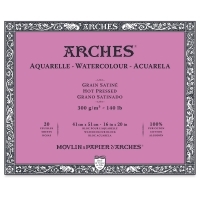 Arches watercolor papers are mouldmade in France, with 100% cotton fiber content. They are acid-free, pH-neutral, gelatin-sized, and air-dried. You can rely on Arches to always be consistent. 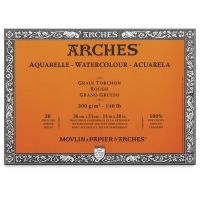 Arches Watercolor Blocks contain natural white, mouldmade watercolor paper that is cut and glued in convenient blocks. 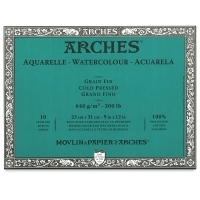 Sheets are 140 lb (300 gsm) weight, with 20 sheets per block. 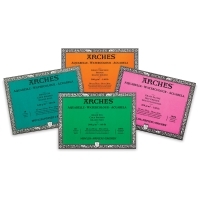 Several sizes of Cold Press blocks are also available in a 10 sheet, 300 lb (640 gsm) variety.